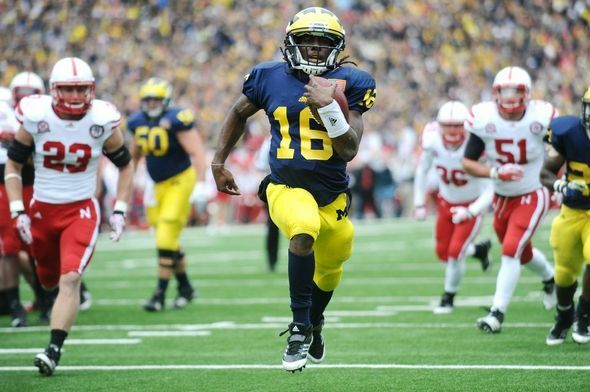 Posted on Sat, Nov 19, 2011 : 8:42 p.m.
Denard Robinson runs for a second-quarter touchdown in Michigan's 45-17 win over Nebraska on Saturday. Denard Robinson was back to his dual-threat self, the Michigan defense took the Big Ten's third-leading rusher out of the game and the Wolverines' special teams were -- well -- they were downright special. Look at the score, 45-17, and you'd expect the highlights came on offense. And a fair share of them did -- mainly from Robinson and Fitz Toussaint -- during Michigan's win over Nebraska. On defense, the Wolverines held Nebraska running back Rex Burkhead to a season-low 36 yards and without a touchdown for the first time this season. The Cornhuskers didn't convert a third down until late in the third quarter. On special teams, Michigan's Terrence Robinson forced a fumble on a kickoff (recovered by Courtney Avery), Josh Furman blocked a punt and Drew Dileo picked up a first down on a fake field goal. It was, by almost any measurement imaginable, Michigan's best game of the Brady Hoke era and it provides even more fodder for next weekend's game against Ohio State. Michigan junior Jordan Kovacs celebrates a fourth quarter play. "I think this is the best win we’ve had since I’ve been on the team, just because it’s so late in the year," he said. • Kyle Meinke column: Michigan's thumping of Nebraska shows it's peaking at right time. • Game story: Nebraska turnovers, big plays carry Wolverines to ninth victory of season. • Denard Robinson matches Tom Brady, manages Michigan offense well in lopsided win. • Notebook: Michigan special teams play up to their name in romp. • Michigan fans help offense cope without a play clock in first quarter. • Photo gallery: The best images from staff photographers Melanie Maxwell and Jeff Sainlar. • Video: Brady Hoke and players discuss Nebraska win, Ohio State week. • Grade the Wolverines: Your chance to rate Michigan's performance on offense, defense, special teams, coaching and overall. • Power outage at Michigan Stadium equals big losses for fundraising groups. • Police arrest 3, eject 42 at Michigan-Nebraska football game. • We strung together live updates throughout the game. Check them out here. • Our live chat was a challenge. With no power in the pressbox, our unmoderated "regulars" took control. That transcript can be found here. • Lloyd Carr, known for his 'tough love,' honored before Nebraska game. • Video: Michigan Stadium transforms into American flag and more. • Michigan Stadium without power prior to Nebraska game. • We asked you to predict the outcome of the game. Seventy-eight percent thought Michigan would win, but just 13 percent thought it would be by "10 or more points." The most popular choice (45 percent) was Michigan by 4-9 points. Sun, Nov 20, 2011 : 9:38 p.m. I can't help but wonder what the disparity is between spending on the futball programs are between Michigan and Nebraska? Nearly 3 to 1? Sun, Nov 20, 2011 : 5:38 p.m.
Been following the AA.com articles much more closely this year and I find many of them informative and fair handed. I do not expect glowing praise each and every week of a MIchigan game performance, not matter what. I don't mind when some of your staff have picked against Michigan in a final score analysis as I don't see any hidden agenda. That's really the point, just write it as you see it. I have my own opinion on the overall fan base and I have learned to become a better fan over the years. I was overly critical of some of Michigan's previous QBs. Being a former student athlete, I should have known better. Fan comments are great for passing the time and now, I can sense the excitment in this Michigan football team that I or we haven't seen since 2006. We all remember the disasterous start to the 2007 season, then the losses to end that season, then the three years of immense pain that followed. Those wounds heal slowly but a 9 win and hopefully a 10 and 11 win season is a great way to get over all of that. Sun, Nov 20, 2011 : 9:59 p.m.
Don, I agree with your assessment of the 2007 completely. As tough a start as that was, I've always felt that Lloyd did a masterful job at rallying the troops and refocusing them on the task ahead of them. As you say, that team could have rolled over and died. Instead, they went on an 8 game winning streak (despite missing Henne and Hart at various times), made it to a New Year's Day bowl game and WHIPPED Urban Meyer and his Gators (making the perhaps future ohio coach 0-1 against our Wolverines, by the way). Carr never allowed that team to give up. Sun, Nov 20, 2011 : 8:04 p.m.
Agree the AA.com articles are very good. The uptick in excitement and confidence in Michigan football is palpable. Couple of notes about the 2007 season -- o Appalachian State was a pretty darn good football team ... yes, Michigan was caught napping and should not have lost that game. But still, it's not like losing to a bad team. o Oregon was a very good team as well o Lloyd Carr did a fine job pulling the team out of the gutter after that 0-2 start. They could have rolled over and played dead. They didn't. Sun, Nov 20, 2011 : 4:28 p.m. I checked the boxscore, there are no defensive stats. Are those not kept? Could they be posted in some fashion? Sun, Nov 20, 2011 : 4:11 p.m.
azwolverine A perfect response! I'd like to be a fly on the wall and see their faces for that one. Sun, Nov 20, 2011 : 3:47 p.m. I work with two Nebraska grads/fans who have told me for years that the Huskers would roll through the Big Ten and that Michigan was no match for them. They thought the B10 title this season was a foregone conclusion. Nothing could have been sweeter than Michigan's blowout victory and the 110,000 Michigan fans relegating Nebraska to afterthought status with their chants of &quot;Beat Ohio&quot; with more than 8 still left to play. I'm actually excited to go to work tomorrow and see these guys! I won't blatantly rub it in their face, though. I'll simply put on one of my Michigan polo shirts, pin on my maize n blue &quot;Beat Ohio&quot; button, and talk about my excitement for our upcoming game against our arch rivals. I think they'll get the point.